Hundreds of hunters take to the moose management areas this morning in a quest for a hearty animal to provide a winter’s supply of meat as today marks the beginning of the official moose hunting season on the Great Northern Peninsula (the bow hunting season began a few weeks ago). This is a tried and true tradition that has been passed on through many generations. The Mayor of Main Brook was eager to get home last night so he could take to the grounds early morning in hopes to get a moose, my mother sent in a text to me, “getting up early to go moose hunting tomorrow” and many other family and friends were up at dusk. It is almost guaranteed moose hunting photos will dominate my Facebook page for a little while. One thing I’m looking forward to is a feed of fresh moose. 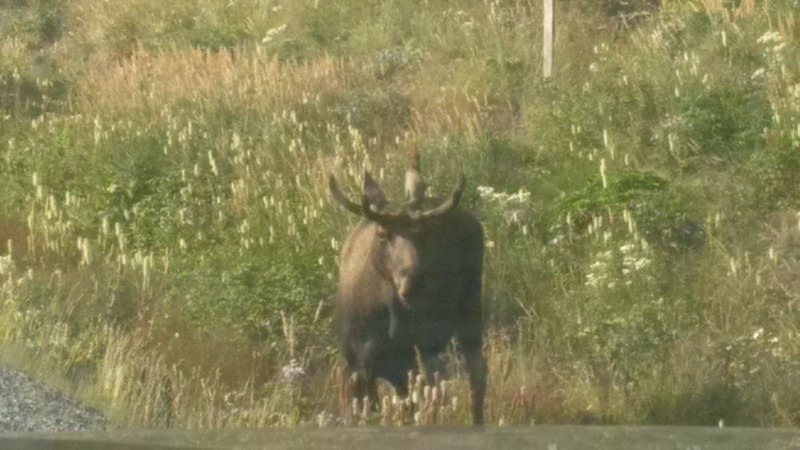 Last night driving on Route 430 and Route 432, I spotted two moose at roadside. This is a good sign for the hunters today. Good luck and happy hunting! Posted on September 13, 2014, in Heritage, Tradition and tagged Great Northern Peninsula, Moose, moose hunting, Newfoundland, tradition. Bookmark the permalink. 1 Comment. – moose/vehicle accidents showed a rise just after 1988. I speculate that this coincided with the loss of the railway. More trucks translated directly with more moose. – accidents climbed slightly through the nineties. Again I speculate this is mainly due to more traffic owing to the improved roads through the roads to rails agreement. – most interestingly the accidents seem to show a more rapid and ever increasing rise after 2005-06. I speculate this coincides directly with the rise of “distracted driving” that also arrived with smartphones. Chris, while people are arguing about the rise in the moose population–and we really cannot argue this point as there’s no reliable data on which to base any arguments, sadly–I believe that distracted driving, driving too fast and taking the whole act too casually is at least as deadly as is anything else. Besides taking proper steps (fences where needed, slowdown areas and such) we, as citizens also need to become a whole lot more vigilant and careful on the highways.